Detached Swift Bordeaux 36' x 12', 6 berth Holiday Park Home held on an unlimited Licence (subject to T&C's) and manufactured in 2010. 2 bedrooms, open plan lounge/diner and kitchen, shower room/W.C., en-suite W.C., double glazing, Calor gas central heating, decking, sea and hill views, allocated parking. Use of site facilities. Swanage Bay View is a holiday park situated on the south-western slopes of Swanage a seaside town which is a ‘Gateway to the Jurassic Coast’ World Heritage Site. Swanage town centre and the main beach are approximately one mile away. A detached ‘Swift Bordeaux’ 36' x 12' park home, which we are advised, was manufactured in 2010. The park home is held on an unlimited licence, subject to terms and conditions. Swanage Bay View has facilities that owners are able to use and occupation of the holiday homes are permitted between 1st March and 15th January each season and we have been advised that holiday lettings and pets are permitted. This holiday home will be sold furnished and equipped (minus the owners’ personal belongings). UPVC double glazed front door, storage cupboard, boiler cupboard, radiator, gas fire with surround and mantle, corner TV unit, UPVC double glazed doors to the deck, views over the town to Swanage Bay and the Purbeck Hills, dining area. KITCHEN AREA: Single drainer stainless steel sink unit with mixer tap and adjoining work surfaces with drawers and cupboards under, space for fridge, built in electric oven and gas hob, filter hood, matching wall cupboards. Obscure UPVC double glazed window, shower cubicle with mains shower unit, low level w.c., wash basin with mixer tap, radiator, mirror, shelving & strip-light/shaver point. 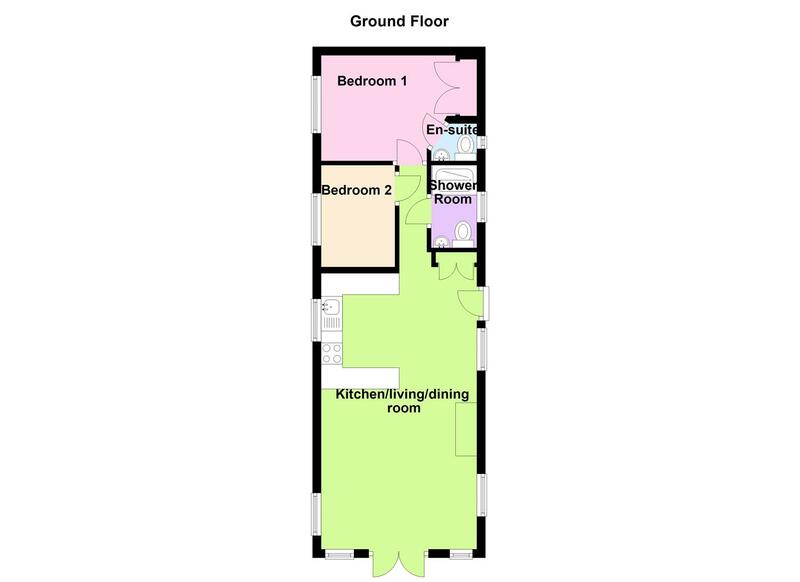 Twin bedded room, built-in wardrobe and shelving/cupboards, radiator, wall light. 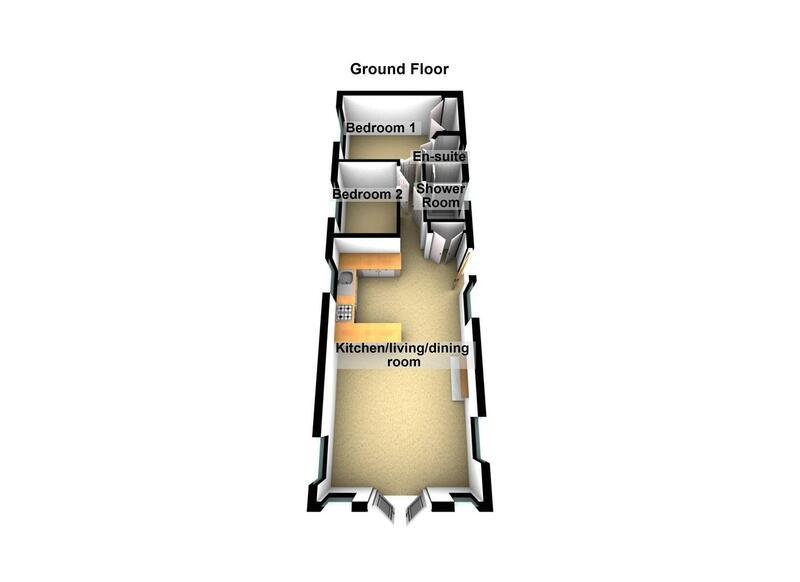 Double bed, radiator, fitted wardrobes, dresser unit with mirror and cupboards, wall light. Door to: EN-SUITE W.C.: Obscure UPVC double glazed window, wash basin, radiator, low level w.c.
Own raised, decked terrace with railed surround and views over Swanage Bay to the Isle of Wight and the Purbeck Hills. We are advised that the park home is held on a licence which is unlimited, subject to the site terms and conditions. Site fees for 2019/2020, the owner advises is two instalments of £2409.68, to include water and sewerage. Additional charges are made for a contribution to the council tax/rates paid by the site, and a supply of the electric and Calor gas. All mains services are connected except gas. Any services or appliances mentioned above have not been tested by Miles & Son.